TALLAHASSEE, Fla. (AP) — A Republican candidate for the Florida Legislature apologized Monday for saying she had a college degree that she didn’t complete. Melissa Howard initially said she would stay in the race “and lead by example from now on,” but has since gone back on that and dropped out of the race according to her campaign treasurer. 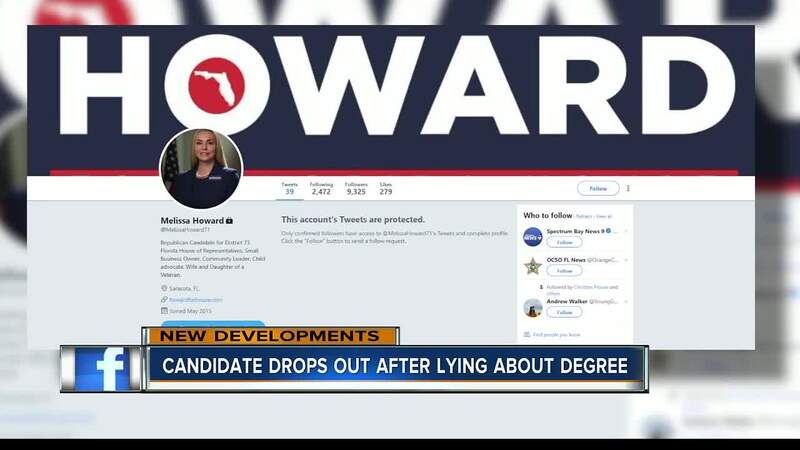 Howard posted an apology on her campaign Facebook page and admitted she didn’t graduate from the school. “I made a mistake in saying that I completed my degree. What I did was wrong and set a bad example for someone seeking public service. I am staying in the race and intend to win and lead by example from now on,” she said. Even though she dropped out, it’s too late to get her name off the ballot ahead of the Aug. 28 primary. Vote by mail ballots were sent out a month ago. The seat represents portions of Manatee and Sarasota counties, where about 20,000 Republican votes have already been cast. “We should just let nature take its course. Let the voters decided if they want her to win the primary,” said Manatee County Republican committeewoman Peggy Simone. In her statement, Howard said, “It was not my intent to deceive or mislead anyone.” It didn’t say what her intent was. Her primary opponent, Tommy Gregory, didn’t immediately respond to requests for comment.